Apparently, ’tis the season for basketball. Earlier this month, I posted about the Hoops clinic Southborough Rec is offering next week. 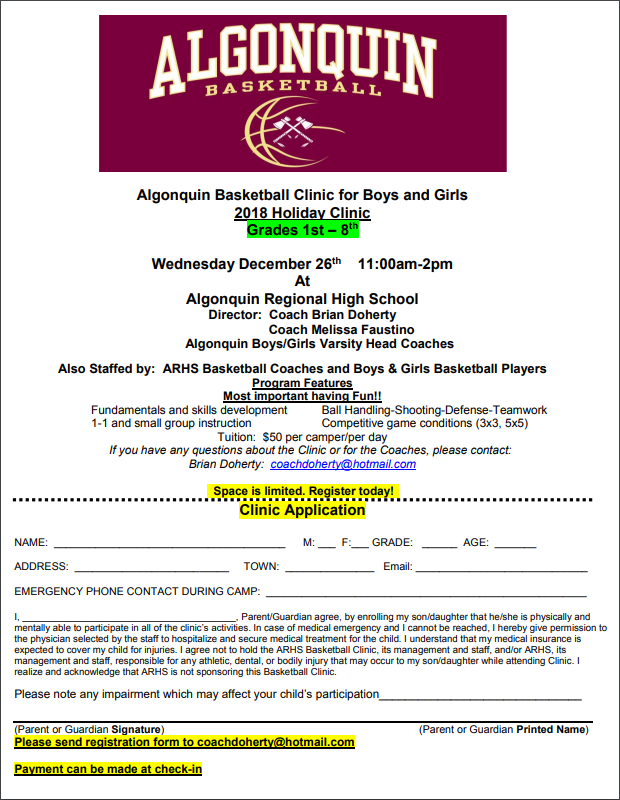 * I just learned a few minutes ago that Algonquin Basketball is offering a one day clinic during next week’s break. The ARHS skills program is for 1st – 8th grade boys and girls on Wednesday, December 26 from 11:00 am – 2:00 pm. Naturally, it’s being held in the school gym. The fundraiser for ARHS Basketball costs $50 per child. 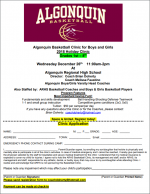 It will be run by Algonquin Regional High School’s varsity coaches and staffed by additional ARHS coaches and players. *Rec’s camp is a 3 day morning camp for 4th-8th graders. Click here for those details.